a classic 8x8 chess board, only the dark squares are used. It is positioned so that each player has a light square on the right side corner. Typically, they are flat and round. The color of one set is black and the other red or white or beige. 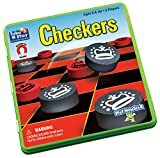 Checkers is played by two players. Each player begins the game with 12 discs and places them on the 12 dark squares closest to him or her. Black opens the game, then players alternate their turns. Randomly determine who gets the black pieces first. 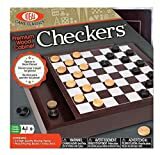 When playing a series of games, the players alternate who gets the black pieces. The pieces always move diagonally and single pieces are always limited to forward moves. A piece making a non-capturing move may move only one square. To capture a piece of your opponent, your piece leapsover one of the opponent's pieces and lands in a straight diagonal line on the other side. This landing square must be empty. When a piece is captured, it is removed from the board. Only one piece may be captured in a single jump, but multiple jumps are allowed on a single turn. If a player is able to make the capture, then the jump must be made. If more than one capture is available, then the player decides if he prefer this or not. Single pieces may shift direction diagonally during a multiple capture turn, but must always jump forward (toward the opponent). When a piece reaches the furthest row, it is crowned and becomes a king. One of the pieces which had been captured is placed on top of the king so that it is twice as high as a single piece. Kings are limited to moving diagonally, but can move both forward and backward. Kings may combine jumps in several directions (forward and backward) on the same turn. A player wins the game when the opponent cannot make a move. This happens usually because all of the opponent's pieces have been captured, but it could also be because all of his pieces are blocked in.